Experience the change from watching the model to actually controlling from the cockpit with first person view (FPV). Take a different perspective on RC. The live video feed from the camera unit mounted on the RC model to the monitor makes you feel like you’re in the moment on the RC model with a true sense of speed. The sense of speed changes when viewed from the cockpit. Experience the scale speed unique to RC models. For example, the 1/18 scale Drone Racer travels at 20km/h, so at 20km/h x 18 it actually feels like 360km/h from first person view. The speed sensation is just like a racing simulator game. Seems like virtual reality, but is actually real! Speed sensation from the video feed to the monitor feels like a racing simulator. But this is real live action. Have you ever given up because your RC car is too fast? Have you ever given up because you turn the steering the wrong way when your RC car is facing towards you? With FPV control you can experience the sensation of speed even at low speeds as well as never being confused with steering direction. 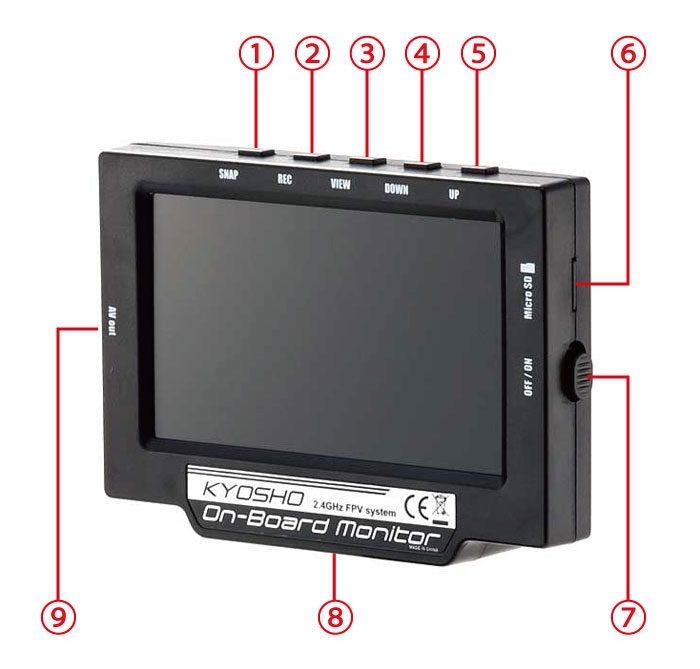 Install the KYOSHO Onboard Monitor on your RC model! 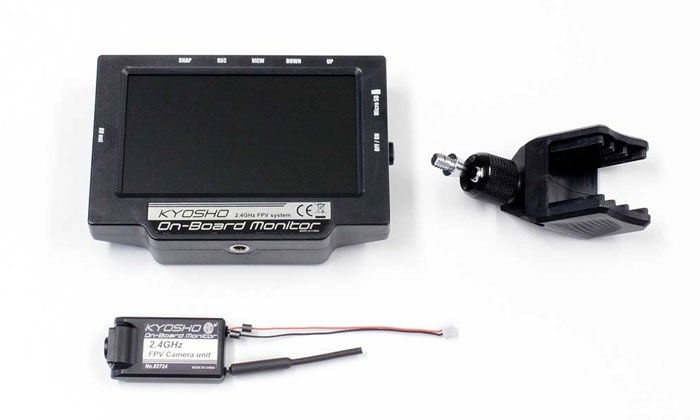 The KYOSHO Onboard Monitor is a wireless camera and monitor set that can be installed on your existing RC model for FPV (first person view) flight or driving control through the monitor. Drone Racer weighs less than 200g even when installed. Setting up an FPV Drone Racer is so easy. Camera unit weighs only 12g. The Drone Racer weighs 142g even with the camera unit installed so the new aviation regulation is not applicable (in Japan). 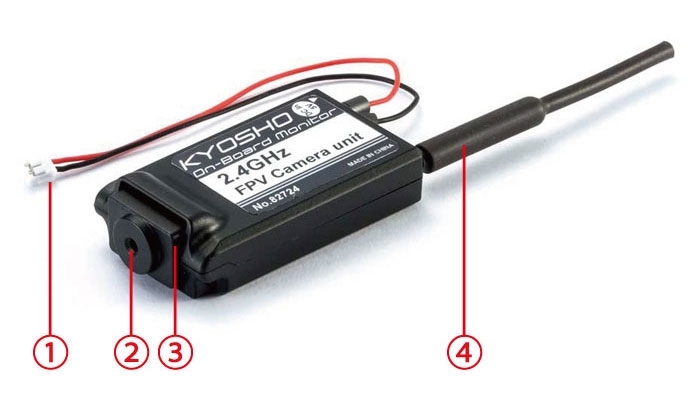 2.4GHz frequency FHSS system is suitable for FPV and requires no special license. Image transfer delay is minimized to 0.16seconds (depending on conditions). 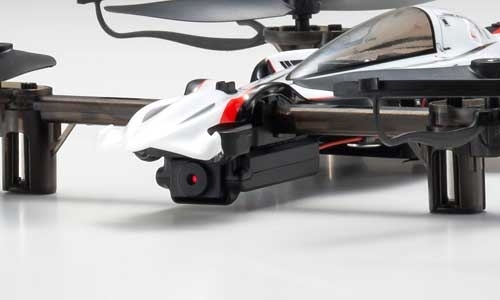 One-piece camera and transmission unit is easily installed on the RC model and adds only 12g. Camera angle can be manually adjusted within a range of ±20 degrees. Maximum transmission range is 60m (depending on conditions). Screen resolution is 420 x 272 pixels and maintains optimal resolution for FPV control. Screen frame rate is 30fbs. Still image capture is also possible. Data can be saved to a micro SD card (sold separately) in the monitor. The camera is simply connected to a 5V socket on the Drone Racer for power. 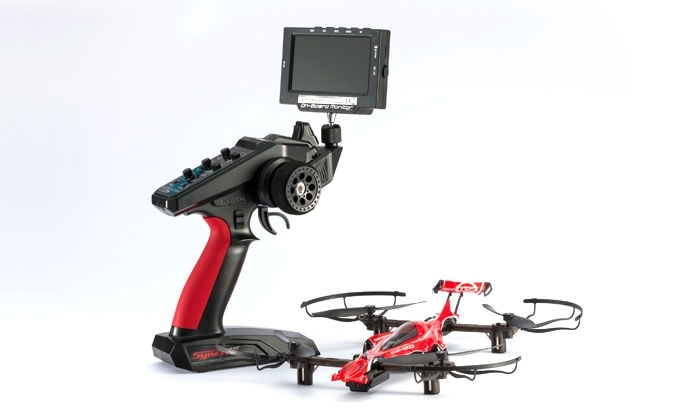 The 4.3-inch monitor is powered by the same LiPo battery as used in the Drone Racer. You don’t need to worry about the orientation of the camera as the image can be flipped on the monitor. A mounting attachment for the KT-231P+ and KT-531P allows the viewing angle of the monitor to be adjusted. 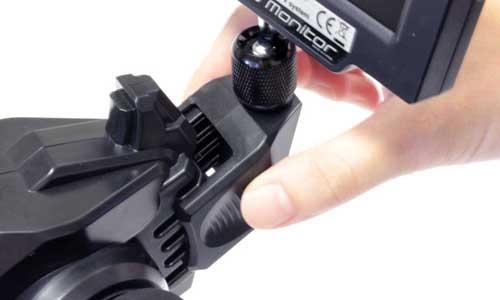 The monitor can be used together with other transmitters with a standard camera tripod. Insert a micro SD (sold separately) into the monitor to save media using the buttons on the monitor to record, stop, and capture still images. Also, saved media can be played back on the monitor. 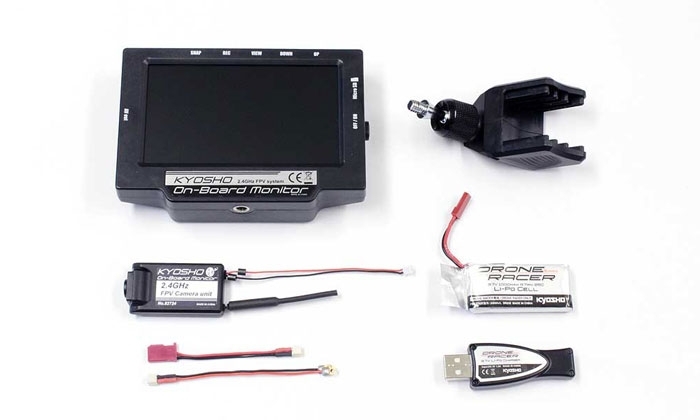 To use with RC models other than the Drone Racer, simply connect to the receiver with a conversion connector or a MINI-Z Racer conversion connector (both sold separately). (Camera voltage is 3.6～5.0V, so a regulator is required if connecting to a higher voltage receiver). 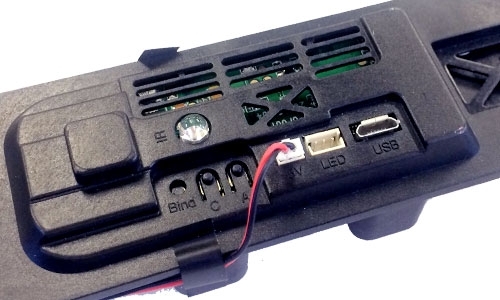 The monitor features an AV output terminal so you can connect to FPV goggles with a compatible AV cable to enjoy the full FPV control experience. ※When installing on MINI-Z, rear shocks must be removed. Also, depending on the body style, the unit may not fit inside the body shell. ※Only compatible for use with standard 5V receivers. A regulator is required if using with high-voltage receivers. Ride in an RC model. KYOSHO RC RIDE ON SYSTEM. It feels like you’ve been miniaturized into 1/18 scale and dropped into the Drone Racer cockpit. acceleration, deceleration, turn, landing and crash, live and in real time. This is not virtual reality. This is real action, in 1/18 scale. ※RC RIDE ON SYSTEM is a reference sample / patent pending. Kyosho opens the door to a totally new RC world.